Dave DeWitt and fiery foods are synonymous -- after all, he isn't dubbed "The Pope of Peppers" for mere comedic relief. DeWitt, in Chicago to turn up the heat on sales of The Spicy Food Lover's Bible (Stewart, Tabori & Chang, $29.95), his latest venture with Nancy Gerlach, eliminates all of Emeril Lagasse's "Bam! Bam!" and "Turn it up a notch" lingo, but there's no doubt DeWitt knows his subject. He is a spice historian. Attired in one of his eight chile pepper-themed shirts ("I don't know whether they are costumes or uniforms"), DeWitt confides he wears the signature shirts so people will say, "That's gotta be the guy!" The shirts will do, he insists -- with a humor as dry as his spicy rubs -- until he has a chile pepper tattooed on his bald head. The publisher of Fiery-Foods & BBQ magazine and the founder of www.fiery-foods.com glances across his Sofitel Chicago hotel room awaiting the anticipated "I-don't-think-so" reaction from Mary Jane Wilan, his wife of 20 years. The Spicy Food Lover's Bible serves as DeWitt's crash course in Spices of the World 101 -- everything from how to buy, grow, store and use a wide variety of flavor enhancers from horseradish to habaneros, wasabi to white pepper, and ginger to garam masala. Gerlach, who teamed with DeWitt on The Whole Chile Pepper Book and eight other cookbooks, uses spices galore in the 250 recipes she created and tested for Bible. DeWitt's favorite Bible recipes are Korean-Style Fajitas and Fresh Margarita Strawberries with Tequila and Cracked Black Peppercorns. "They're outstanding," he raves. DeWitt and Gerlach prefer spiciness in the medium to medium-hot heat range and caution those who have milder taste buds to simply use fewer pungent spices in recipes. "Taste as you go -- know what hot means to your taste buds" is DeWitt's recommendation, adding that it is easy to add more spices but nearly impossible to remove the hot stuff and problematic to try to dilute dishes. "People aren't afraid of spices anymore," says DeWitt, citing the trends of natural, vegetarian, low-fat and no-salt foods as other reasons for the increased popularity of spicy foods. "You can pick your own heat scale and flavor components -- it's going beyond but not forgetting black pepper, ginger, wasabi and horseradish." "Speaking of wasabi," DeWitt interjects, "did you realize that when you go to your favorite sushi restaurant or market that 99 percent of the green paste you are being served is imitation wasabi, made from horseradish, Chinese mustard, cornstarch and green food coloring?" He follows with a mini-lesson: Real wasabi is a rare and expensive delicacy confined mostly to Japan and New Zealand though, even in Japan, only 5 percent of sushi shops can afford to use fresh wasabi. Recently, Pacific Farms in Oregon began growing and selling wasabi ($25 for six 43-gram tubes). DeWitt, a native of Virginia, says his mother's spicy, "but pretty tame" spaghetti sauce was the extent of his knowledge of spicy before falling in love with the food and culture of New Mexico in 1974. By 1984, he and Gerlach had co-authored The Fiery Cuisines. Now the 61-year-old considers himself an expert griller and smoker -- leaving "the inside kitchen stuff" to his wife. DeWitt uses rubs (dry spice mixtures) on his favorite brisket, salmon and pork chops. 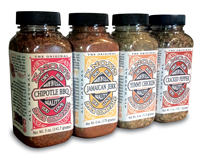 Non-snobbish DeWitt doesn't rely solely on hand-concocted rubs; his favorite commercial rub, hands-down, is Knox's Spice Company Chipotle B-B-Q Dry Rub made in Chicago. For ingredients for Bible recipes, DeWitt recommends Tom and Patty Erd's The Spice House on Wells Street in Old Town. The spice guru reminds that it's important that rubs be made from the freshest possible ingredients, "not the ground oregano that's been in your cupboard since 1986." He explains that older spices and herbs oxidize, or turn rancid, and either lose or gain flavor. DeWitt suggests buying spices such as mustard, black pepper, cumin and coriander in their whole form, and then grinding them in a spice mill, coffee grinder or a mortar and pestle to make the rubs. Rubs do not store well -- leftovers should be placed in a small jar with a tight seal and placed in a cool, dry cupboard or in the freezer. For cooling down between bites of spicy foods, DeWitt suggests palate cleansers including sliced fruits such as mango, peach, plum, pineapple and papaya; pickled vegetables such as eggplant, cauliflower, carrots and cucumbers; cheese wedges; grated coconut; high-quality olives; chutneys and relishes; breads, flavored tortillas and crackers, and sorbets. For the perfect finish for a fiery feast, DeWitt debunks ice water ("as soon as the water leaves the mouth, the fire rages on"), hot tea ("there is no logical reason for it to work since it's 99 percent water") and lemon juice ("we can't picture our guests sitting around the table sucking on lemons"). He favors Scotch on the rocks, reasoning "Well, if you drink enough of it, you soon won't care about cooling down!" Returning to his serious side, DeWitt says that dairy products, particularly yogurt, are the best antidote for capsaicin (the crystalline alkaloid that causes heat in chile peppers). To put out internal fires, he highly recommends the Indian yogurt and fruit drink called lassi. Undecided about a next book, DeWitt is turning his attention to the TV show "Secret Life of Fiery Foods" in October on the Food Network and the 18th Annual National Fiery-Foods & BBQ Show he and his wife will produce March 3 to 5 in Albuquerque. After his Bible book tour, DeWitt is returning to New Mexico and the tomatoes, eggplants, specialty lettuces and chile plants in his garden and the black pepper plant in his greenhouse. A voracious reader, he will devour books about food and science and catch up on his beloved crime novels. He will find time for Scotch on the rocks; his Cornish Rexes Roswell, Ella Fitzgerald and Libby, and his Doberman pinschers Mimi and O'Ryan. Dave DeWitt's life might be comfortable, but it's anything but bland. The Spicy Food Lover's Bible offers helpful advice on how to buy, grow, store and use a wide variety of hot flavor enhancers. Sandy Thorn Clark is a Chicago-based free-lance writer. Copyright 2005 Chicago Sun-Times, Inc.